If you are running a WordPress blog and don’t know how to migrate to a better looking WordPress template so that you can make your blog more attractive for readers; then this article is specially written for you. Administrator login details of WordPress account. To change the WordPress blog template you need a theme. If you can invest in paid theme that is great else you can even download any free WordPress template from online resources or from WordPress theme Directory. There are numerous sites those offer free customized templates. You can also Google for more options. I would suggest bloggers to select at least 3 templates so that if you don’t like one you can move on to another. Once you finalized the templates then you can download them by clicking on “Download Button”. Step 1 – Login into your WordPress account. Step 4 – A new window will open where you can search the blog theme. With the help of “Find Theme” make a search for the desire theme. 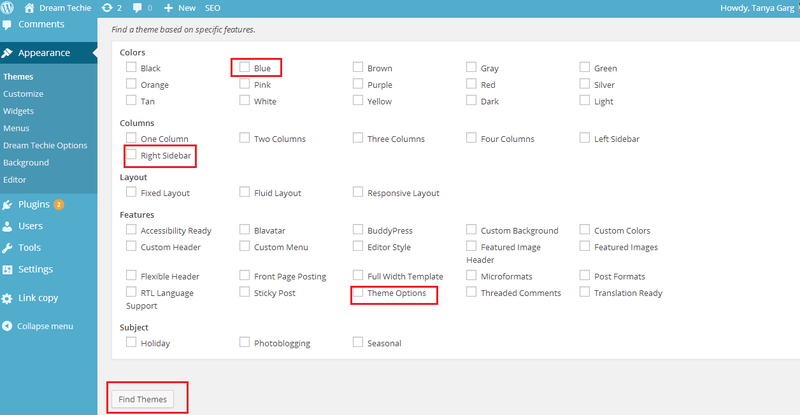 User can even select color, theme style to search themes. Step 5 – From the list of search results if you like any blog theme then simply click on “Install Now”; “Install Now” will be available just below to that template. Step 6 – WordPress will start downloading that template and once the download will complete you will see the option “Activate”. Click “Activate”. This is all done, now you can check the new look of your blog. Users can even customize this template. Step 4 – Select “Upload”, a new window will open where you have to browse the downloaded template from your PC. Step 5 -Once uploading fill finish WordPress will ask you to activate that, Click on “Activate”. Important points to check before and after you migrate to New WordPress theme. Note down all the plugins on paper so that you can give a check. Backup your WordPress with the help of any WordPress plugin. Test new uploaded template in all browsers and OS. Ask your readers for suggestions and feedbacks. Nice share, It’s an useful share for newbies and the screenshots added by you made this post easy to understand. Content is very helpful for new comers. but you should post a full content that how to install wordpress and setup a theme on it. Thanks tanya for sharing such great useful things with us.. I think people really like this blog. Hello Tanya ,Really Helpful Post. this post will Helpful in new bloggers. Thanks Kapil or the kind words.